I saw this butterfly yesterday while working in my garden spreading old hay around rhubarb and currant bushes. It had probably just emerged from its chrysalis earlier in the morning and was finishing up drying its wings. The butterfly is the Mustard White Butterfly (Pieris oleracea) a species native to North America and occurs in Canada from the Northwest Territories south to Alberta and then east to the Atlantic seaboard. In the US it can be found from North Dakota to Maine. The green larva with a single white or pale yellow lateral line and small black spots feed on members of the mustard family (Brassicaceae), such as rock cress (Arabis spp., Boechera spp., and Draba spp. ), cuckoo flower and bittercress (Cardamine spp. ), and toothwort (Dentaria spp.). There are usually two or three generations a summer with the last generation overwintering as a chrysalis. Adult Mustard White Butterflies come in a spring and summer forms. The one in the photo is the spring form. Summer forms have less dark shading on the wing upper surfaces and the lower surface veins are also less dark. Adults feed on nectar usually from mustard family plants. 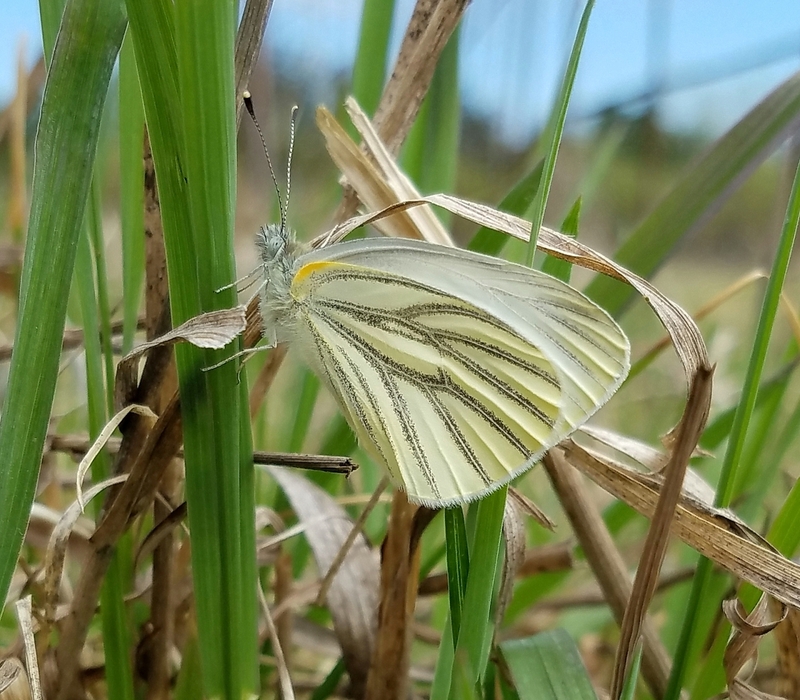 Previously Mustard White Butterfly was considered to be in the species Pieris napi, a European species commonly called the Green-veined White. They are regarded as distinct enough to be classed as separate species although some authorities consider the North American P. oleracae to be a subspecies of P. napi (synonym Artogeia napi) calling it Pieris napi subsp. oleracea. P. oleracae differs from P. napi by having chalky white upper wings while P. napi has dark spots and dark margins on the upper wings. Another difference is the tolerance of P. napi for garlic mustard (Alliaria petiolata) which is toxic to the larvae of P. oleraceae and thus a serious concern for the species survival where this plant occurs in North America to which it is not native. Heinen R., Gols R., and Harvey J. A. (2016). Black and Garlic Mustard Plants Are Highly Suitable for the Development of Two Native Pierid Butterflies. Environmental Entomology, Vol. 45 (3):671–676. Mustard White (Pieris oleracea) (Harris, 1829) at the Canadian Biodiversity Information Facility website. Pieris oleracea at the Wikipedia website. Species Pieris oleracea – Mustard White – Hodges#4195.1 at the Bug Guide website. Many insects have evolved false eyes or “eyespots” on different parts of their bodies presumably to deter predators. The butterfly shown above is the Northern Pearly-eye (Enodia anthedon formerly known by Lethe anthedon) and has many “eyes” on its underwings. But why so many and what might they be for? Eyespots are thought have at least two effects on potential predators. One is to frighten them off especially if the eyespots are suddenly displayed and resemble those of a more dangerous predator. Another is to direct the attention of the potential predator towards the spots which it then attacks. The second idea might be the case for the eyespots on the Northern Pearly-eye Butterfly. The eyespots may function as a decoy away from the head prompting a predator to strike this non-vital area instead only to get a mouthful of dry scales. Wing damage patterns have been cited as evidence for this. But why attack the eyes at all? And how are eyes a decoy away from the head anyway? Wouldn’t the eyes see the predator coming and alert the prey? It would make more sense to sneak up from behind or below out of the vision field. Further, the eyespots on the Northern Pearly-eye, which are thin yellow circles surrounding a larger darker circle with a small white fleck, are not very good imitations of mammal or bird eyes like these on the Emperor Moth. Maybe the damaged wings on seen on some Northern Pearly-eye and other butterflies with similar eyespots were not made by a confused predator but by one who attacked too quickly and missed getting the whole butterfly in its mouth. Another proposed idea is that these are signalling devices to attract mates or intimidate competitors of the same species although I’m sure how this could be tested. It could be the things we call eyespots are not mimicking eyes at all. The Northern Pearly-eye is one of three similar looking species in the genus Enodia, one of two genera separated from Lethe, the other being Satyrodes, found in North America. 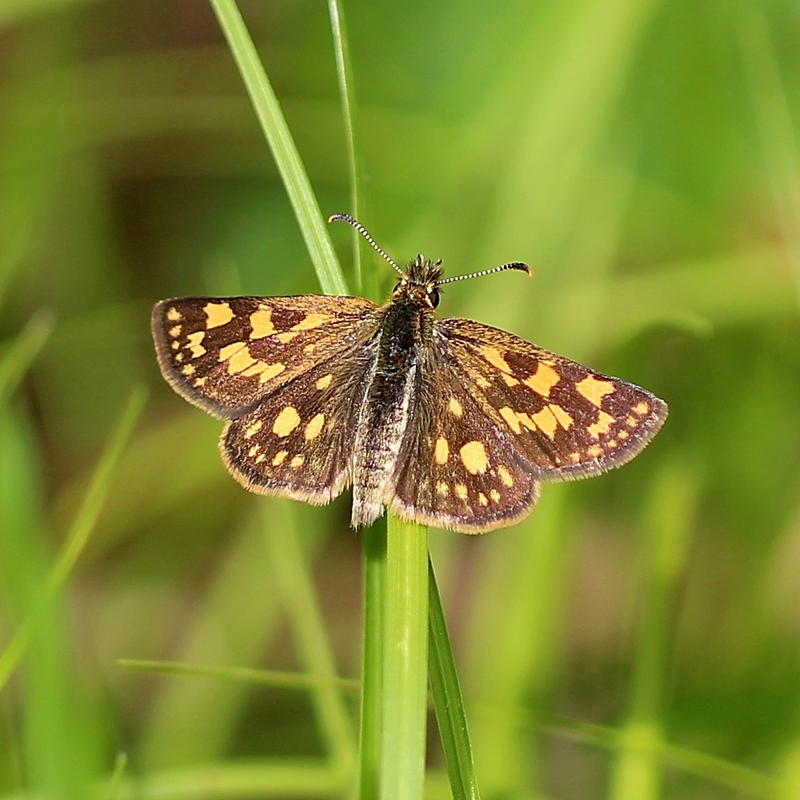 It extends further north and west in its range than the other species but overlaps with Satyrodes eurydice and S. appalachia in the Great Lakes Region and Appalachians and E. portlandia and E. creola along its southern margins. Northern Pearly-eye is a medium sized butterfly with a wingspan of 45 to 53 mm. It is a soft purplish-brown on both the upper and lower wings which have somewhat scalloped margins. The eyespots usually have a roundish white pupil in the center. The last eyespot on the underside of the hindwing has two pupils or more often is formed from two eyespots that are merging into what looks like the number “8”. The easiest feature to separate Northern Pearly-eye from the other Enodia and Satyrodes species in field are the club-shaped tips on the antennae. These are black in E. anthedon but yellowish in S. eurydice and S. appalachia, orange in E. portlandia, and yellow-orange with or without a black basal band in E. creola. Eyespots on the underwings of S. eurydice and S. appalachia are ringed with a white outer circle. The second eyespot on the underside of the forewing of E. anthedon is much smaller than the rest which helps to distinguish it further from S. appalachia. Eyespots of E. portlandia and E. creola, both species of the southeastern US, are usually surrounded by a diffuse white band or circles although this is not always well defined. Larvae (slightly fuzzy, green with a pair of red-tipped “horns” at each end, and with longitudinal yellow stripes) of Northern Pearly-eye feed on grasses such as short-husk grass (Brachyelytrum erectum) which grows in mesic to moist forests and bottle brush grass (Elymus hystrix) and false melic grass (Schizachne purpurascens) which grow in mesic forests and clearings. Eggs are laid individually on the host plant. After hatching the larvae feed up until the third or fourth instar after which they hibernate appearing the following spring when they resume feeding and growing. Further south in its range there are two generations per summer so it is only the second brood that overwinters. Adult Northern Pearly-eyes feed on dung, carrion, and sap from aspen and birch. One of the few butterflies that inhabit forests, look for Northern Pearly-eyes in moist to mesic forests either in small openings or along edges near marshes and streams. The peak flight season is in July and August over the northernmost part of its range but begins in June further south. The genus Lethe, to which Enodia and Satyrodes once belonged, is now generally considered to include only Old World species. All are in the Tribe Satyrini. Discovered at Last: Lethe creola (Nymphalidae:Satyrinae) is a Resident of Florida. John V. Calhoun, Patrick R. Leary, Bill Berthet, and Andrew D. Waren. Southern Lepidopterists’ News Volume 37 No.2 (2015), 81-87. I was very excited to find this larva of Papilio canadensis (Canada Tiger Swallowtail Butterfly) in late August last year preparing to form a chrysalis thinking I could photo its progression day-by-day. Maybe I might even see it emerge as a butterfly the following spring. As the days wore on there was no change to the larva. After two weeks I began to think something was wrong here. Shortly after that it was gone from the leaf. Whether it died and fell off or was eaten I don’t know. This caterpillar is on an aspen leaf one of the species’ larval host plants. Other preferred larval foods are willow, cherry, and ash. The eye-spots on the larva’s thoracic segments presumably deter some predators. Interestingly, the young larva resemble bird droppings.